Sean Bonar laughed as he told the story of the hovercraft Taylor Fedun built his senior year at Princeton. 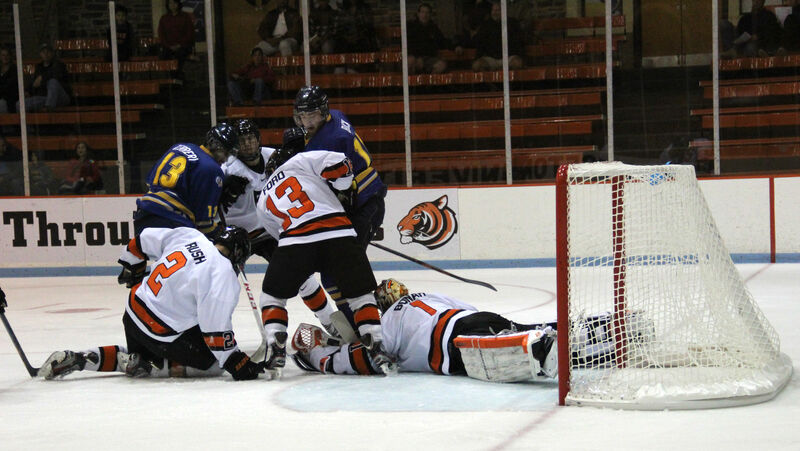 Fedun, a mechanical engineering major, worked on his project the same season he captained the Tigers. “He excelled both on the ice and off the ice and he was unflappable,” Bonar said on the phone. It was 2010-11 and Bonar was a freshman then, but now he’s looking back to those years for some leadership advice. “I take my cues from the seniors that have come before me,” Bonar said. Ritchie and Fedun were of two eight seniors who guided Princeton’s 10 freshmen that season. Bonar, who enters the season as Princeton’s only goalkeeper with collegiate experience, said he’s looking forward to his new leadership role. “Your upperclassmen, your seniors are the ones that win your championships, they certainly take the lead in that,” Prier said. Bonar said he’s trying to teach the freshmen what wearing orange and black means — something he learned from the seniors before him. Princeton’s senior class includes Andrew Ammon, Andrew Calof, Eric Carlson, Will Ford, Jeremy Goodwin, Kevin Ross and Alec Rush. The nine seniors enter the 2013-14 campaign with 595 games of experience combined.